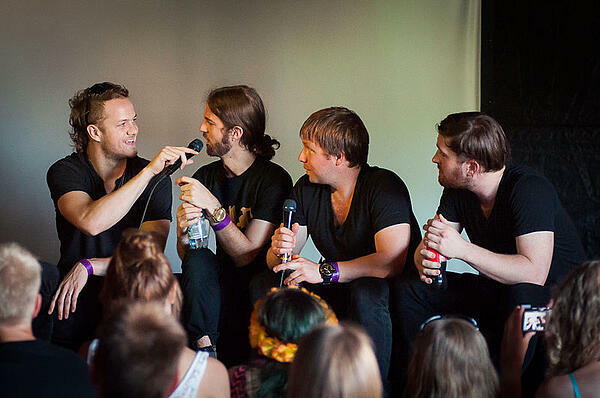 Imagine Dragons being interviewed at the 2013 Ilosaarirock Festival in Joensuu, Finland. Photo credit: Tuomas Vitikainen. One of the most fun parts of the music journalist’s job, at least for people like me, is the opportunity to have a conversation with a musician whose work we like. When we are doing our jobs well, we spend hours in advance of the interview listening to their records, reading past press, talking about them with like-minded friends and thinking about what we want to say. The best music journalists come to an interview with a set of questions prepared, and we always hope to have come up with at least a handful that the artist hasn’t been asked by other interviewers before us. But no matter how prepared we are, no matter how thoughtful our questions are or how much time we’re willing to dedicate to the interview process, these conversations are two-way streets. Whether you have a great interviewer sitting across from you or someone with a litany of “What’s your favorite…” questions, there are some strategies for being compelling in conversation. Put some thought into what you do, and the message that your press materials send. When most artists put together a press kit, they include a bio of some sort that sets the tone for the narrative they want to spin about the current album or the band as a whole. Whether you write the bio yourself or have someone else do it, familiarize yourself with that narrative, as it will likely be the basis for some of the questions you are asked. Spend some time thinking about how you feel about your music, what you’re trying to say with it and what it means to you. Write these thoughts down. Then, when you are inevitably asked about it later, you’ll be prepared with thought-out answers. Do the hard thinking before the interview begins. We journalists can only write so many stories about bands who don’t have much to say about themselves. Anecdotes are both your friend and your interviewer’s friend. They take writing about something rather esoteric and different to talk about and ground that airy pursuit. Real stories, rich with detail, that relate in some way to the music or the people who make it can be the key that really unlocks the potential for a great piece. Here’s a great example from The Casket Girls. Hopefully, you won’t be asked too many yes or no questions in an interview, but in the event you are, don’t settle for answering with a single word. Elaborate upon your response. Perhaps someone will ask you, “Were you influenced by so-and-so?” If you were, talk about how that manifests itself in your music, or what about that particular influence is meaningful to you. If not, go on to say some of the things that did influence you. Apply this way of thinking to any question that invites you to stop after a brief answer, and try to find something of value to add. Remember, we can only “get it” if you give it to us. Any interviewer worth their salt is going to come into a conversation with an artist with some ideas of their own about that artist’s catalog and persona. The point of the interview is to get to know you better, and to share that knowledge with people who care about you. So the more information, commentary, personality, intimacy, humor and stories that you bring to the table, the more likely it is that the finished article will feel like a reflection of you and your values. We and our readers are hungry for insight. It’s up to you to decide how much of yourself you want to share. But if you can find parts of yourself that you’re comfortable releasing into the public consciousness, you’re much more likely to be successful.